Ten-man Boca Juniors will feel they have been denied justice after bitter rivals River Plate beat them to the 2018 Copa Libertadores title 5-3 on aggregate, as extra-time goals from Juan Quintero and Gonzalo Martinez secured a 3-1 win in Sunday's controversial rearranged final second leg in Madrid's Santiago Bernabeu. The match was suspended twice in November due to an attack on Boca's team bus by River supporters, but the Xeneizes' demands to be handed the title fell on deaf ears and River will return to Argentina with a fourth Libertadores crown. The opening 45 minutes grew progressively more fiery as half-time approached, with Boca ultimately deservedly edging ahead through Dario Benedetto's brilliantly worked goal in the 44th minute. A similarly applaudable Lucas Pratto goal levelled things after the interval to secure an extra 30 minutes, and Wilmar Barrios' sending off handed River the initiative, as Quintero gloriously put them ahead and then Martinez rounded things off in the closing stages. Boca should have taken an early lead when the ball broke kindly at a corner for captain Pablo Perez – one of those injured in the bus attack – but he shot straight at Franco Armani. Benedetto was successful just before the break, however, skipping over Jonatan Maidana's tackle and coolly slotting past Armani to finish a devastating counter after Nahitan Nandez's sublime pass. Out of necessity River improved after the break and they got their deserved equaliser in the 68th minute – Pratto sweeping home from the centre of the box after Ignacio Fernandez's cut-back at the end of an incisive move, ultimately forcing extra time. 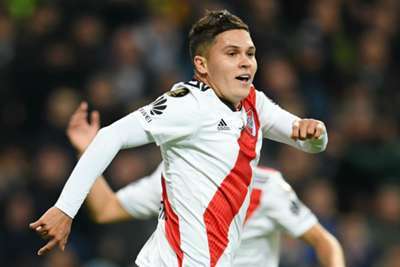 Barrios was shown a second yellow card early on in the additional period for appearing to stamp on Exequiel Palacios, and River capitalised in the 109th minute – Quintero's 20-yard stunner going in off the crossbar. Boca pushed desperately for an equaliser and hit the post with a deflected Leonardo Jara effort in the 120th minute, but from the resulting corner they were caught with everyone – including goalkeeper Esteban Andrada – in attack, and Martinez raced home on the break to score into an empty net and begin the River celebrations. In an era seemingly obsessed with the exporting of sporting events – such as NFL in London, pre-season tours of Asia and LaLiga trying to stage a game in Miami – the importance of this contest goes beyond the violence and on-field action. While CONMEBOL insists it will not become a habit, a Madrid-based final still sets a precedent for the rest of the world. As thrilling and fascinating as the game was, it was not really one for individual skill. But in a game of ferocity and bluster, Pratto was excellent as River's target man, bringing a degree of calm as he linked well with those behind him, and he also got a well-worked goal. It was a poor showing from Boca's goalkeeper. He was arguably lucky to avoid conceding a penalty for a collision with Pratto, while he was then caught completely out of position for the striker's equaliser. A trip to the United Arab Emirates and the Club World Cup now beckons for River, who will see themselves as the biggest threat to Real Madrid. As for Boca, it remains to be seen whether the club attempts to take any further action against the circumstances of the final with CONMEBOL.